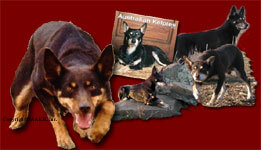 Working Australian Kelpie - The stockdog of choice. Cattle, sheep, goats - all livestock. The Registry and NAAKR Breeders listed on the Breeder Page are very pleased to answer questions regarding the Working Kelpie. We appreciate general questions about the breed and serious inquiries about purchasing a dog. Who better to answer your questions, then a purebred breeder. If you are serious about purchasing a dog, making an initial inquiry by e-mail is effective. Always use the Registry subject line or indicate Kelpie in the subject line and sign your e-mails. However, we strongly suggest you make phone contact with the individuals after the initial inquiry. If emailing all of the breeders on the list, give them the courtesy of letting them know you are doing so and have not just sent to them. Buyers must have ethics too. General Breed or Registry Questions? For general questions such as "what is a Kelpie?, how do I register my ....., or how long does the registration process...." please go to the "Questions" section. E-mailing the Registry - kelpieinc@junct.com Please read below. Please use the Registry subject line or put something pertaining to the Kelpie or Registry in subject line of e-mail. Email is a secondary means of communication for us. We answer emails approximately every 14 days or so. If you require a quicker response please don't hesitate to telephone. See next section regarding policy or regulation inquiries. While you may make the inquiry regarding policies and regulations via e-mail, it will be responded to on letterhead through the U.S. Postal Service. Telephone - 918-784-2643 Central Standard Time. Please call at a reasonable time. When leaving a message, repeat phone number - clearly - twice. Thank you. Fax - Call for fax number. Copyright 1999 - Infinity, NAAKR, Inc. All rights reserved on content and graphics.